WASHINGTON — A day after Vice President Mike Pence directed NASA to return humans to the surface of the moon by 2024, NASA Administrator Jim Bridenstine told members of Congress that this goal was “very aggressive” and would require additional funding for the agency to achieve. Bridenstine, testifying before the commerce, justice and science subcommittee of the House Appropriations Committee March 27, also said the agency was studying ways to accelerate development of the Space Launch System, but couldn’t guarantee that the vehicle would be ready for a first flight in the middle of 2020. The hearing on the agency’s fiscal year 2020 budget request was scheduled prior to the March 26 meeting of the National Space Council in Huntsville, Alabama, where Pence directed NASA to accelerate its human space exploration plans to land humans at the south pole of the moon within five years. Bridenstine, who was at the meeting, endorsed the plan and said it would make continued use of the SLS, backing away from proposals two weeks earlier to consider using commercial launch vehicles for the Exploration Mission (EM) 1 flight of Orion in mid-2020. Bridenstine reiterated that commitment to using SLS for EM-1 at the hearing. “While some of those options are feasible,” he said of the two-week study that looked at commercial alternatives for EM-1, “none of those options are going to keep us within budget and on schedule.” He didn’t elaborate on the specific options the agency considered. NASA is now looking for ways to speed up development of SLS for EM-1. “How do we accelerate, really, the SLS at this point?” he said. Bridenstine revealed that NASA is undertaking a 45-day study to look at ways to speed up work on the SLS, with a particular focus on the core stage, whose development issues have been a key factor in the vehicle’s delays. That report will be completed “in a couple of weeks,” he said. Among the options is doing away with the “green run” test of the SLS core stage, which would involve shipping the stage from the Michoud Assembly Facility to the Stennis Space Center and setting it up on a test stand where the stage’s four RS-25 engines would fire for eight minutes. Skipping the test and sending the completed stage directly to the Kennedy Space Center, industry sources previously said, could save several months in the EM-1 schedule. “The question is, is that necessary?” Bridenstine said. “Could we test each engine individually at very high off-nominal kinds of conditions to get certainty, or at least eliminate as much risk, or almost as much risk, as we would if we ran the green run.” Doing so, he said, could save six months of schedule. The idea of eliminating the green run test got the attention of one committee member, Rep. Steven Palazzo (R-Miss. ), whose district is home to Stennis. He asked Bridenstine for a briefing about alternatives to that test. Another way to speed up the schedule is to change how sections of the core stage are integrated. Bridenstine said NASA was already acquiring the tooling needed to allow for horizontal integration of the core stage rather than vertical integration. Bridenstine said that horizontal integration would allow other parts of the SLS core stage to come together while work continues on the stage’s engine section, which is more complex and time-consuming to complete than originally expected. “We’re trying to move that engine section out of the critical path,” he said. 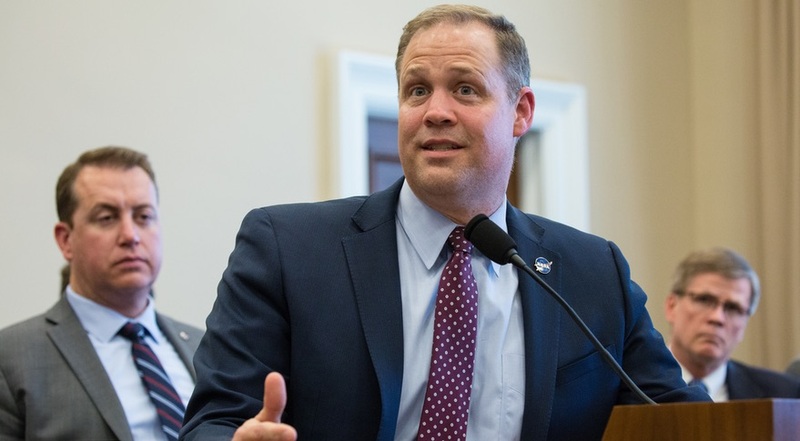 While those and potentially other measures could cut the development schedule by months, Bridenstine stopped short of saying that EM-1 can still take place in June 2020, the formal date for the mission. The likelihood of delays beyond June 2020 prompted the study of commercial launch vehicles earlier this month in order to find ways to allow EM-1 to still launch in the middle of next year. Once the EM-1 mission, and the first crewed mission, EM-2, take place, Bridenstine talked about ramping up production of SLS and Orion to support up to two launches a year. Members also pressed him to commit to developing the Block 1B version of SLS with its more powerful Exploration Upper Stage, as well as a second mobile launch platform designed specifically for the SLS Block 1B. Bridenstine, though, did not elaborate on the specific plan that will enable humans to return to the lunar surface by 2024, nor the estimated cost. At one point in the hearing, Rep. Charlie Crist (D-Fla.), one of the members who advocated for SLS Block 1B and a second mobile launcher, asked if the budget request delivered to Congress earlier this month support a human return by 2024.